The Finance Minister Mr. Arun Jaitley presented Budget for the Financial Year 2017-18 in the Parliament. In this budget he has offered relaxation schemes for the farmers, senior citizens and women’s. He offered tax relief in Income tax slab rate FY 2017-18 AY 2018-19 to the salaried class person. After the post demonetisation this budget is very important for As per the latest Income tax slab rate FY 2017-18 AY 2018-19 we have to discuss few important things in this article. As per the latest announced Income tax slab rate FY 2017-18 AY 2018-19 there are few changes are made in the tax slab. Any person who is earning up to Rs 3 lakh with in a year has been exempted from paying the taxes, while those having income upto Rs 5 lakh will be charged income tax at 5 percent on his annual income. If your annual income is up to Rs 5 lakh then you have to fill single page return form. If your annual income between Rs 2.5 to 3 lakh then you will get tax credit u/s 87A of Rs 2500. There is no need to pay income tax if your annual income is up to Rs 3 lakh. But you must file your income tax return. 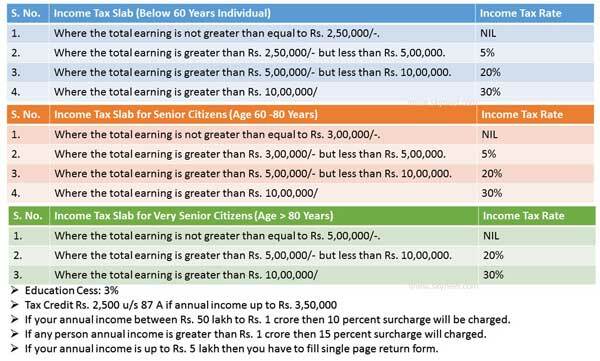 For eg: As per the latest income tax slab any individual whose age is up to 60 years annual income is Rs. 3.5 lakh then will pay tax amount Rs 2575 at the place of Rs. 5150. If any individual annual income is Rs 3 lakh to 5 lakh then the income tax rate is 5 percent. Annual income is Rs 5 to 10 lakh then tax rate is 20 percent otherwise tax rate is 30 percent. If your annual income between Rs 50 lakh to Rs 1 crore then tax rate is 30 percent. Apart of that 10 percent surcharge will be charged. If annual income is greater than Rs 1 crore then 30 percent tax rate and 15 percent surcharge will charged. I this guide we have discuss Income tax slab rate FY 2017-18 AY 2018-19 for individuals. If you have any suggestion regarding this guide then please write us in the comment box. Thanks to all.